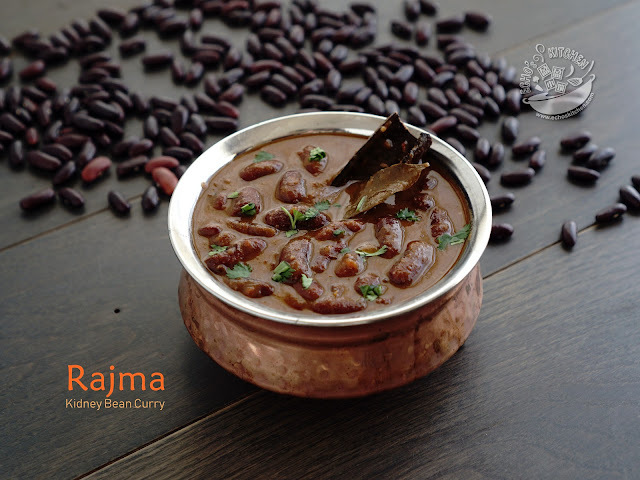 Sometimes the same dish with a little twist brings about completely different taste and feel. 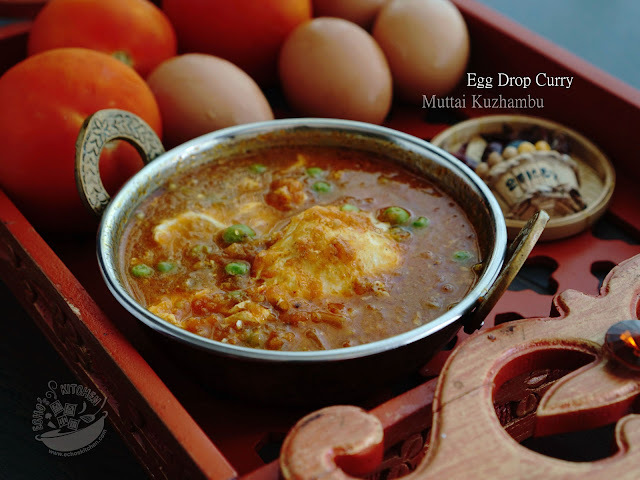 This poached egg/egg-drop curry is one of them, it is a lot faster to make and equally tasty as compared to other egg curry dishes. A quick fix when one have lesser time. 1. Heat 1-2 tbsp of cooking oil in a cooking pan, add mustard seeds and onion, cook until mustard seeds cracked and onion become translucent. 2. 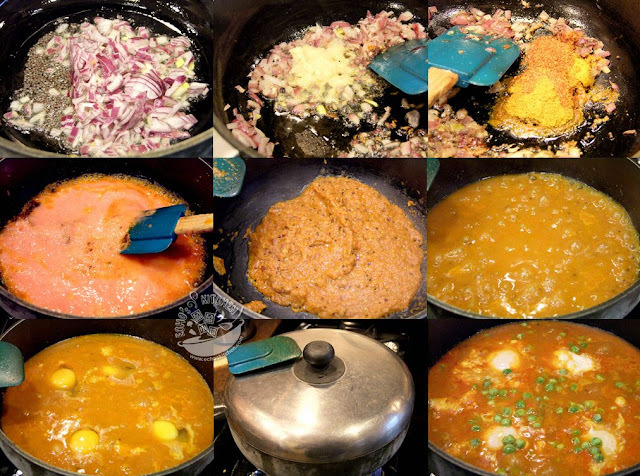 Stir in ginger garlic paste, when the smell of ginger garlic releases, add curry powder and chili powder and stir well. 3. Add ground tomato, cover with lid and bring to boil. Cook for 5-8 minutes at medium heat until oil separated at the edge. 4. Add 2 cups of water and bring to boil, season with salt, sugar and ketchup, once the gravy starts boiling, crack and drop one egg at a time at different corners of the cooking pan/pot. 5. Cover with lid and cook at medium heat for 3 minutes until the eggs changes color. 6. 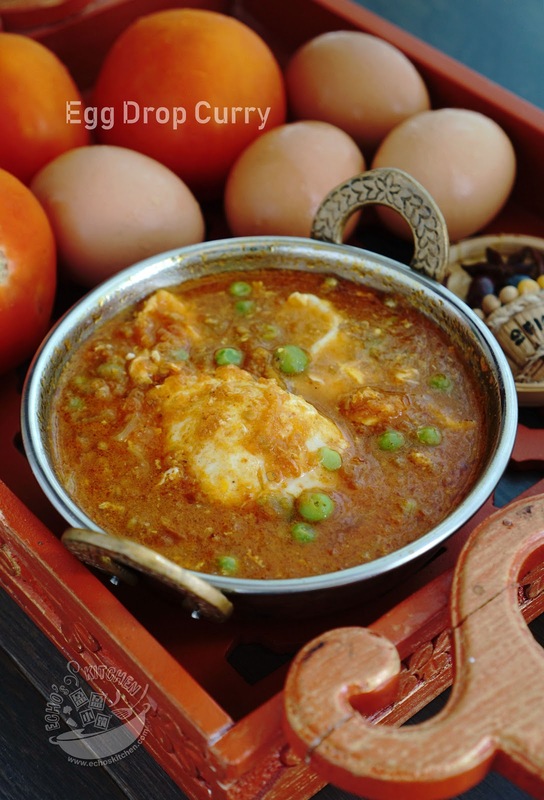 Add frozen peas before turning the stove off, cover with lid and wait for 5 minutes before serving with rice or roti.